Feng shui for office is an important application of feng shui as is the feng shui for the bedroom. We tend to spend many hours at the office, be it a home office or an outside work environment. 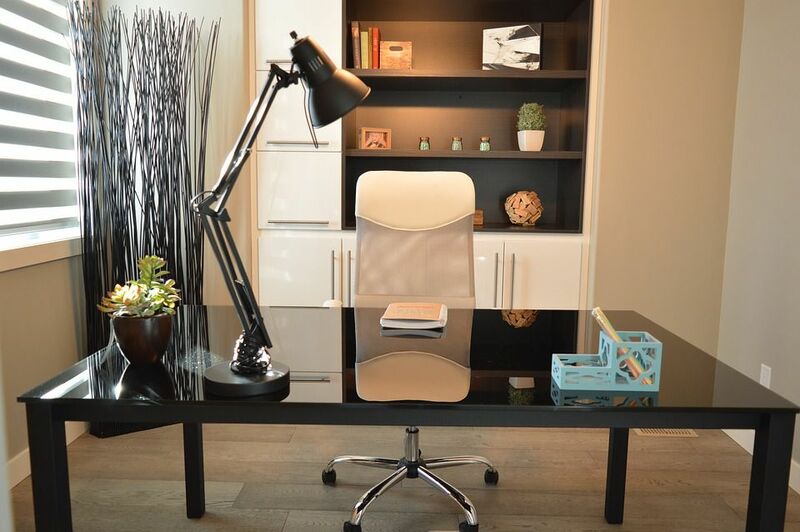 If you have been neglecting your work environment, take some time now to pay attention to the feng shui of your office, and we mean really pay attention to what is going on in your workspace. Answer some basic feng shui questions, such as, for example: What is happening behind your back? What do you first see as you come in? What is the quality of the air you breathe in? The quality of light? By applying just simple and basic feng shui office tips you can considerably improve your productivity and well-being at work, as well as create subtle shifts in the relationship with your co-workers. Let's look into a quick feng shui case study, an example of how to deal with challenging feng shui in the office. The suggestions below are basic feng shui suggestions that were given at the feng shui forum based on a user's question. Her office space was set in a way where her back was to the door, she had several file cabinets positioned at an angle to her office chair and way too many items on her desk which created visual clutter. There was no focal point or any inspiring energy to uplift her, so it was easy to understand why she was feeling tired and irritated at work. Here are the basic feng shui solutions. See if any of these recommendations can be applied in your own office space. If you have your back to the door, window, or the overall office traffic, your energy will tend to get weak and insecure. Strong feng shui backing can be created in many ways - from placing a row of big lush plants behind your seating area to slightly repositioning your office chair so you have the wall at your back. Sha Chi (the feng shui name for poison arrows) is the attacking energy that can deplete and weaken one's energy, so it is important to remedy this situation. The easiest way to deal with feng shui poison arrows is to slightly reposition the furniture so that there are no sharp angles pointing at you while you work. You can also place any office suitable item in front of the sharp corners in order to neutralize this bad feng shui energy. Art or any office appropriate objects that bring you happy, uplifting memories can be extremely helpful. This is a must for any office space, be it big or small, as one's personal energy can get quickly depleted at the office. What you bring is up to you. For example, if your child's brightest art will look good in your space, by all means, bring it, as we are all deprived of color! This does not mean you have to go Zen with nothing on your desk, but it does mean only have the items that you are working on that day; let your desk breathe. A cluttered space creates a cluttered mind, we have all heard that many times. Plants will do the best job by bringing fresh energy from nature (if you take good care of them, of course! ); be sure to choose a plant that not only looks pretty but also purifies the air (most office spaces have high indoor pollution levels). Of course, there is so much more to creating good feng shui in any space, including your office. However, all you have to do is start (and commit to keeping your office space fresh and happy). Then more will follow!